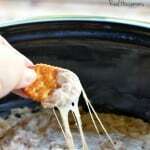 CROCK POT CHEESY BACON ONION DIP is a warm, addictive dip that your guests will be begging for at every party! It makes a great appetizer or football snack! heat on high 1-2 hours or until warm and cheese has melted.